On February 13 we told you about the closure of Atrium Shade Company, located at 824 NW 46th Street in Ballard’s West Woodland neighborhood. “Unfortunately, it appears to be permanent. According to the companies website, Atrium Shade began producing shade systems for commercial atriums and skylights in 1987, and later began manufacturing roller shades. The website also shows that the company employed 15 full-time employees. No word on what has happened to these people. Several buildings near Atrium Shade’s 12,000 sq. 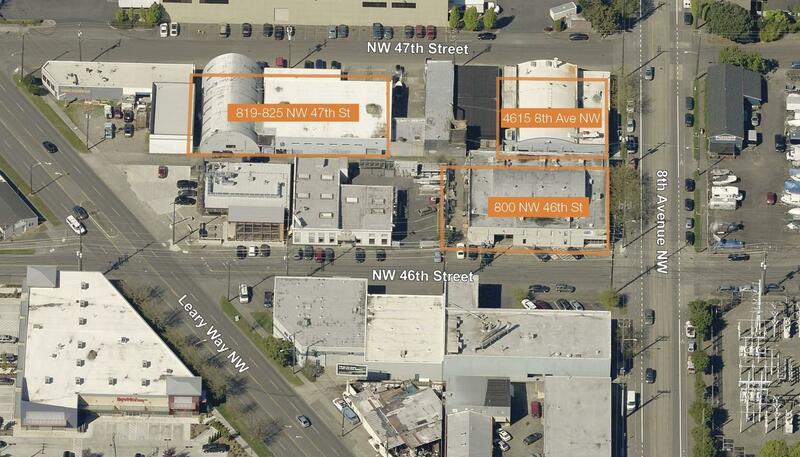 ft. facility are for sale, including the building Skills Inc. recently vacated at 800 NW 49th Street. Photo below shows three parcels currently for sale, and is courtesy LoopNet. Atrium Shade is the building just west of 800 NW 49th Street.